Feb 6 (BusinessToday.In) – Sitting next to your refrigerator is the best thing you could do this Valentine’s Day if you are looking for a date! Samsung has launched a dating app called ‘Refrigerdating’ that will allow you to find ‘the One’ with the help of a photo of that leftover pizza or a bottle of fine wine in your refrigerator. By uploading an image of your food, you can get in contact with others who have realised that ‘you are what you eat’! Just upload an image of what all you have stuffed inside your refrigerator and let the world know what kind of person you are. The Refrigerdating app will then hook you up with a different fridges based on the food items inside the fridges. Pick the one you like. If you are a calorie conscious type, a fridge with protein shakes and some chicken slices could be the first step towards coming face-to-face with your soul-mate. Is your fridge chaotic or orderly? The condition of the your fridge might just connect you with the one who’s your type. The Refrigerdating app works with the Samsung Family Hub Refrigerator. The $4000 family hub can save you from clicking pictures and can do it for you automatically. But if you don’t have the Hub, you can still take pictures with a normal smartphone and upload it manually. Everything else works like Tinder. Enter your name, age, gender and city. You are also required to type in the gender and age ranges of those you are interested in dating. Give a shot bio and you are done and ready to go on a Tinder-style journey into the assortment of refrigerators. You can swipe right to say “Let’s get cooking” or left to say “Not my taste”. 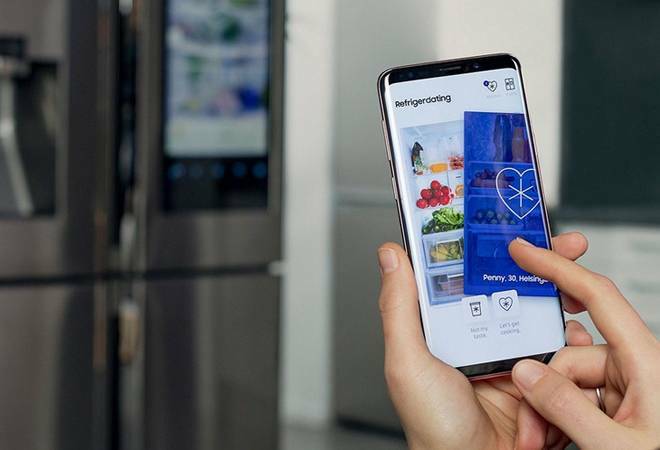 Samsung has requested the users of the Refrigerdating app to not cheat by neatly organising the refrigerator before clicking pictures. It wants people to find the fridge that’s perfect for them. The unorganised fridge might just find you the honest ‘mess’ you need in your life.